The Horror Movie BBQ: Really Old Batman Valentines! Valentines Day is upon us. You know what that means. CANDY. Lots of tasty chocolate and those neat Little Debbie heart cakes. And while the days of giving Super Mario valentine cards in first grade are far behind me, I'm always finding cool new and old valentine cards that I may have never seen or may have forgotten. It's usually pretty fun. In fact, my girlfriend still has a bunch of her old ones from her childhood that we have hanging on the fridge. Because our fridge needs a Valentine with Bebop and Rocksteady. 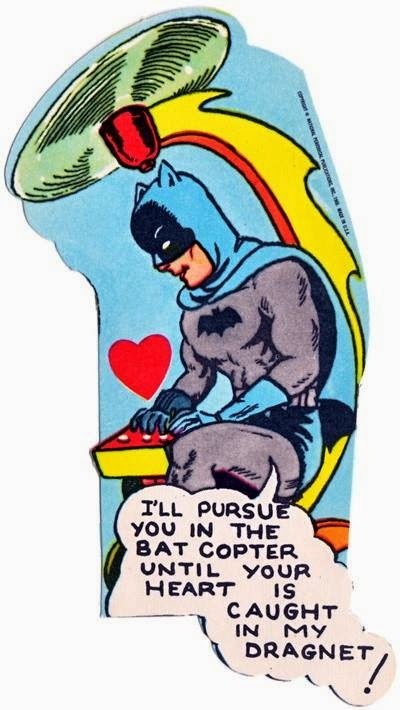 And good gosh, I can honestly say I have NEVER seen these Batman Valentine cards from the 60's a day in my life. I'm sure if I had, I would've made a post regarding them before. Because they really are that fantastic. Check these babies out! Holy crap. Considering his parents died at a young age, you have to guess Batman has issues with being needy and stuff. How needy? So much, he's willing to follow you around town in his goofy Lego contraption and take notes on you. I'm not the biggest expert in love, but I'm sure stalking with the goal of who knows what just isn't the best way to get a sweetheart this year. I'd be afraid of giving a girl this card only because I'd fear she'd turn me in for threats of stalking. And holy crap, Batman's head to body ratio is seriously off. Seems he's suffering from Gigantism. This is definitely not one of the better Batman illustrations. Once again, we find Batman blabbing about how he wants to stalk you. This time, he even reveals that he's using his BatComputer to retrieve information on you. Now if you ever saw the original tv show, Batman used his BatComputer to gain as much information on the villains of the week. Now if he can discover the real names of The Joker and Colonel Gumm, then surely he can see pictures of you at Coconut Joes hitting beer bongs. Scared? You should be. There's nothing that frightens me more than a grown man in his underwear looking at photos of me smoking a cigarette without a shirt from 15 years ago. So, beware Valentine, Batman is watching you and will no doubt find you. If he does find you...well, you may become the next Robin. And I'm pretty sure he's up to 4 at this point. 5 if he finds you. On to the bad guys. Mr. Freeze is a character driven by the death of his wife and obsessed over it. Usually his stories revolved around kidnapping some super model or Batgirl and planning to making them the new Mrs Freeze. This card somewhat reflects that in a very bizarre way. While it resembles an episode from the tv series, it's also a very weird card for children to give to each other. Essentially, much like the previous cards that threatened stalking, this card threatens kidnapping with the great caption "Don't give me the cold shoulder! Let's not act like Mr. Freeze, Valentine!". The caption alone makes no sense if the person you give this to knows nothing of Mr. Freeze and his icy shenanigans. Although, the name Mr. Freeze should say it all. This may be the creepiest card of the lot. That girl you like rejects your smooth advances? Screw it. Kidnap her and put her in a giant block of ice. That'll show her!!!! And judging by that giant heart he's holding, Mr. Freeze is planning on doing some serious transplant surgery after her body gives out due to hypothermia. Which is interesting, because his secret identity is that of Dr. Victor Fries. This card just has creepy horror movie villain written all over it, doesn't it? This may be the most bland card. Zelda the Great was a magic themed villain made exclusively for the tv show and quite frankly, made very little impact. Her main heist was kidnapping Aunt Harriet and balancing her over a giant barrel of fire. To be honest, it was a crappy two episodes and that's all I remember. I also remember her NOT appearing in a jail getup. I have to imagine the illustrator took some liberties here to make her somewhat appealing since she was like 90 in the show. The caption is pretty pretty dumb too. How is her crime waiting on ME? Am I really that important? I mean, I never deemed myself a heartbreak kid or something when I handed my cards out. And I'd expect my valentine not to put me on that kind of pedestal. It's just weird. And I'm sorry that driving you crazy, but I never told you to kidnap Batman's aunt and almost fry her. I'd say this girl has more issues than she's letting on. My gosh, what is it about all the chicks in Gotham having some weird issue? They're either obsessed with cats, clowns, plants or bats and now I'm being blamed for crimes? Crap. If someone gives you this valentine, head for the hills. IMMEDIATELY. By far the most interesting valentine card and of course, the most iconic villain in this series of cards. Riddler was always one of the best portrayed characters on the show by the late great Frank Gorshin. 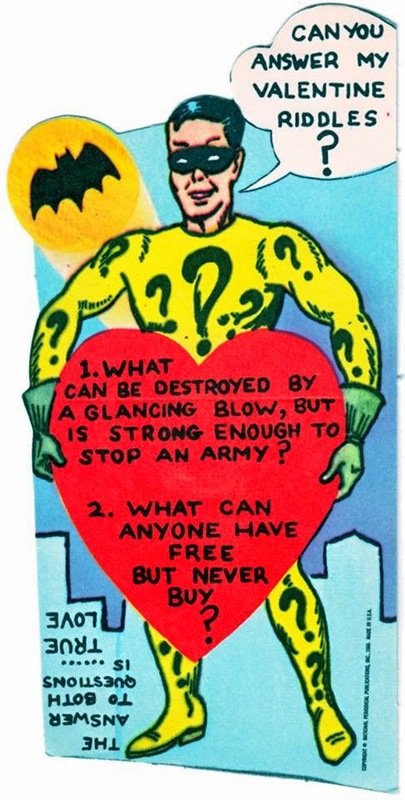 I'm guessing the Riddler's valentine relate riddle is just a cover up for robbing the bank or something. I mean, the BatSignal is already up. Be that as it may, valentine cards with trivia or jokes were always a favorite of mine. A clever joke can always be the way to my heart. So why not start off the relationship with a nice, clever, crisp riddle? The only concern I truly have is why the Riddler is holding this over his crotch. I mean, we all know he loves riddles but is he covering up his true excitement? At this point, I'm pretty sure I don't want to find out. Those costumes on the tv show were known for being too tight and revealing, so I'll thank Mr. Nigma for covering up any unnecessary moose knuckles. Bonus points for being considerate in that regard. Riddler wins the award for most considerate and least crime-suggesting valentine. Good for you, Ed Nigma, you go Ed Nigma! Yes, I closed that out with a Mean Girls reference. Admit it, these cards are pretty fetch.